db heads to Atul Kochhar’s new restaurant Kanishka, which promised to showcase cuisine from India’s lesser-known regions, and discovers plates of soft shell crab with peanut and mango chutney, steamed sea bass and a ‘cheeky’ peanut butter and salted caramel parfait adorned with gold leaf. 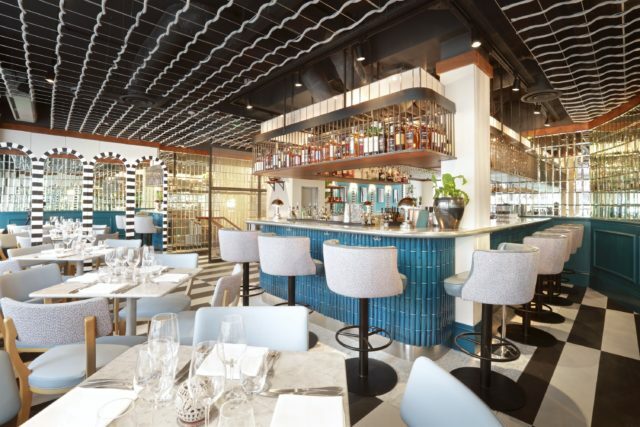 The concept: From chef Atul Kochhar comes Kanishka, which opened in March on Maddox Street in Mayfair. Kochhar made a name for himself while working at Tamarind in Mayfair, which won a Michelin star in 2001. He left to open Benares in 2002, which was awarded its own Michelin star four years later. The new restaurant aims to showcase cuisine from India’s lesser-known regions and is a joint partnership between Kochhar and Tina English, another recognised innovator of London’s Indian dining scene, having previously worked as commercial director for Indian Restaurants Limited to develop The Cinnamon restaurant brand. The restaurant itself is named after King Kanishka, an emperor of the Kushan dynasty in the second century, who practised the Buddhist values of including kindness, fairness, honesty, humbleness and a sense of equality. The decor: Pushing open the antique front doors, guests are greeted to Kanishka by a pair of topiary elephants, setting the tone for Kochhar’s tropical, modern Indian outpost. Kitted out like a candy-striped mint humbug, Kanishka’s art deco-inspired main dining room is tasteful, yet playful, and not in the least bit tacky, despite the aforementioned humbug comparison. It’s really very pretty, adorned with green foliage, mirrors and intricate beading throughout. Split across the ground and basement floors, the 127-cover space includes a statuesque central bar to the front, offering a spot to enjoy a pared down evening of drinks and bar snacks. A ‘small terrace’ (perhaps more accurately described as a smoker’s refuge) sits to the front, which I’m sure will come into its own in the summer, while an intimate, 12-cover garden room awaits at basement level. The food: Given Kochhar’s prior specialisms, it’s no surprise that he should have chosen Indian as the cuisine for his next venture. But it’s not an easy cuisine to reinvent. Rather than replicate what he achieved at Tamarind and Benares, with Kanishka Kochhar hopes to open diners eyes to “previously unexplored” areas of Indian cuisine, including the Seven Sister States in the most easternmost region of India – namely Arunachal Pradesh, Assam, Meghalaya, Nagaland, Manipur, Tripura and Mizoram. It is Indian fine dining, but with a street-food twist, introducing influences from rural India and airlifting them into the heart of urban Mayfair. The menu is familiar, with Atul’s chicken tikka pie served with a cumin-scented berry compote, likely to entice traditionalists, in the Anglo-Indian sense, but there are also many more ambitious dishes to demonstrate Kochhar’s flair and experimental approach to modern Indian cuisine. Salting, smoking and fermenting, made necessary by the remoteness of the regions that his menu is inspired by, are common, as are the use of ingredients like soya, raw meat, dumplings and noodles, drawing upon the influence of bordering countries such as Nepal, China, and Bangladesh. Signature starters include Gangtok momos filled with Kentish lamb and served with fermented vegetable chutney and Tibetan guinea fowl thupka, a classic North-eastern noodle and meat soup with coriander and green onion. A rather tempting Sikkim-inspired venison tartare with mustard oil mayonnaise, naan crouton and onions also caught my eye, although I can’t vouch for execution. Seafood also plays a starring role, over which Kochhar wields a necessarily firm hand when it comes to spice. None of the dishes we sampled were overpowering in this department, with intensity of flavour, rather than unnecessary heat, instead shining through. The soft shell crab with mango and peanut jhal muri (a street food from the Bengal region made from puffed rice and an assortment of spices) and passion fruit chutney (£17), for example, was a treat for the senses. A melt-in-the mouth crisped crab drizzled in burnt lime brought the delicate spices to life. A plate of Zutto fish and oysters arrived deep fried in a light rice beer batter, oysters in their shells, served with fermented tamarind ketchup (£15). A winning combination. 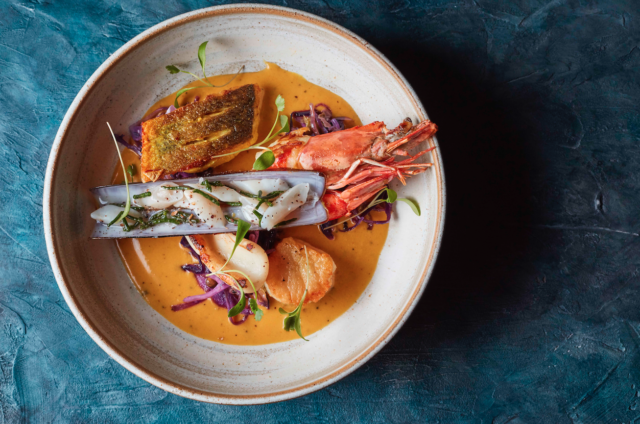 Mains include the signature Seafood Alleppey Curry (£28), a dish of pan seared seafood and coconut and turmeric sauce, which has emerged as one of the restaurant’s most visually striking dishes. Presented atop a bright orange spiced emulsion, it delivered on flavour and execution. I only wish it had looked more like the photo used to entice curious diners through the doors. On our visit, at least, it seemed to be lacking the puffed up statement langoustine, which was instead languishing low, which left the dish looking a little flat. A menagerie of razor clams, scallops and squid withstanding, garnished with coconut shavings, its remnants were nevertheless feverishly mopped up with a puffed naan or two. The highlight was a banana leaf steamed seabass sorrel chutney with pineapple and shrimp kutchumber (£28) – the latter being a salad dish made with fresh chopped tomatoes, cucumbers, onions, lemon juice and chilli. Cooked to perfection, the flaky fish was a delight to devour. A bread basket (£10) amounted to five assorted naans stacked high, more than enough for four to share, alongside a simple bowl of rice (£4). 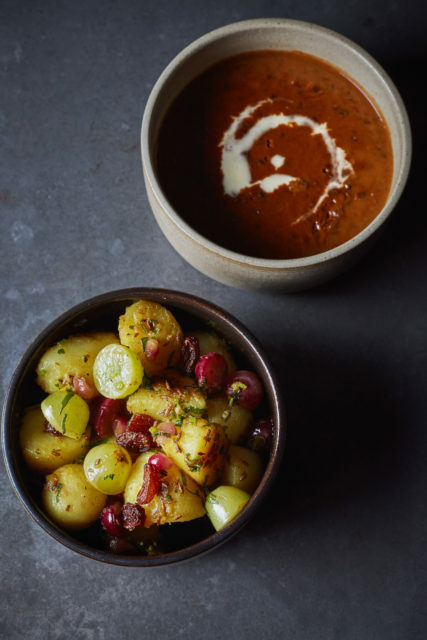 A side of the exotic-sounding Angoori Hing Aloo (£8) was enough to draw our interest, and turned out to be one of the most flavoursome dishes of the night – a spiced potato salad tossed with grapes and pomegranate, which offered a tempered punch of spice. Perhaps mimicking Heston Blumenthal’s famed meat fruit, in reverse, dessert came in the form of a salty-sweet, silky peanut butter chikki parfait with salted caramel and caramelised banana, coated in 24 carat gold leaf, (£8.50) which could have passed for a rather glam chicken liver pate. It was divine. The drinks: The wine list at Kanishka starts from a very reasonable £6.50 a glass, with a healthy by-the glass offer featuring a variety of crowd pleasers, from the Ana Marlborough Sauvignon Blanc (£10.50), (which paired beautifully with our spiced seafood selections), to Charle’s Smith’s Kung Fu Girl Riesling, from Washington. Sparkling wines come courtesy of the likes of Ridgeview and Taittinger, by the glass. Krug and Louias Roederer feature by the bottle, at upwards of £300. By the bottle the list is more extensive, thought not huge. It’s a well-formed, concise list with helpful tasting notes alongside each wine, a simple yet often forfeited feature of a wine list. Signature cocktails include the Roast Banana Old Fashioned (£8.50), made from Tandoor roasted banana with cinnamon, orange and pecan bitters, maple, and the more savoury Ingrita (£8.50), made from Mezcal served with a chilled lightly spiced tomato broth. 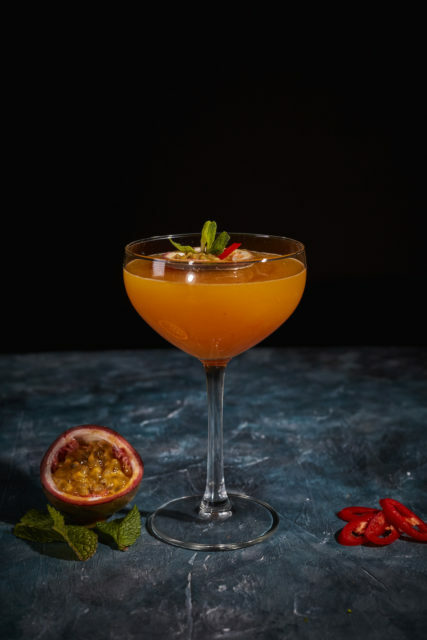 ‘Kanishka’s World of Imagination’ meanwhile will allow diners to create their own highball drink from a menu of herb and spice distillates, mixed with a choice of naturally flavoured tonic waters and their spirit of choice. The bar is also stocked with more than 50 expressions of whisky, including a unique selection sourced from India. Last word: Kanishka is not cheap, although if choosing to dine in the heart of London’s Mayfair, one would expect not. The question is, does Kochhar’s cuisine justify its price? After some deliberation, admittedly, I came down firmly on the side of yes. It won’t suit all wallets, but it offers a menu that doesn’t shy away from doing something new, has embraced its Mayfair locale with gusto, and offers the adventurous diner something different in London’s increasingly saturated restaurant jungle, where only the toughest survive. Our a la carte meal was a little shy over £200, for three courses including sides, and a restrained drinks order. But you don’t have to go all in to get a taste of Kochhar’s cuisine, Kanishka offers a very reasonable two course set menu for £24, or three courses for £29 three, at lunch (12pm – 14.30pm, Monday–Saturday) and dinner (between 17.30pm–18.30pm and 21.30pm onwards, Monday–Sunday). While early days, one senses that Kochhar could be priming his new enterprise to be his next Michelin conquest. The potential to reach such heights is certainly there, threaded throughout Kochhar’s innovative and ambitious menu, executed with the necessary enthusiasm and panache. It delivers on quality and style, and carries a certain sense of grandiosity that is befitting of a star. Who knows, perhaps a hat trick is on the horizon. But that shouldn’t be the sole aim. Kanishka still has room for improvement, but marks a triumphant return to London’s dining scene for Kochhar – a past, and now current, master of Indian fine dining.